I wanted to give a shout out to the folks at Just Bento for a fun and informational site. It’s no secret I love older music. By the time I discovered this album, the group had already disbanded (with some members going on to form the group LAMA). It’s a shame too, because this was such a standout album. It takes all that was enjoyable about millennial music and wraps it in a blanket of bubbly electronic goodness. The Japanese lyrics, with the occasional English thrown in, have a rhyme and catchy repetitiveness. I often find myself trying to sing along, usually horribly. I may not understand the lyrics, but I try not to let that stop me from enjoying something new (even if it is old). All of the songs on this album are pretty solid. “Baby Once More” is reminiscent of a song by Sugar Ray, while “New Young City” has more of a Goo Goo Dolls/Verve feel. My other favorites include “A.O.S.A.”, “Blue Subrhyme”, and “I’m Nothing”. Because Amazon doesn’t have any track previews, I’ve included some Youtube videos below for your viewing pleasure. One of my friends once asked me, “Why don’t you go teach English in Japan?” My first thought was, I’m not a teacher. She knew I had been trying to learn Japanese, and no doubt some cultural immersion would be a good thing. After doing some research, I learned that being a teacher is not necessarily a prerequisite to participate. It turns out that Japan often accepts a limited number of native English speakers each year to assist in their education program. The best part, participants are expected to study Japanese as well. I know for sure I would enjoy doing this, but it’s a fairly large commitment. Hopefully by the time applications for the 2014 year are accepted I will have decided if I want to proceed. I’ll have to consider leaving my employment and living arrangements, all the natural disasters, and even the political environment. I’d hate to arrive just before N. Korea decides to test a nuclear device on the island or miss the opportunity to go for the same reason. If you are a U.S. citizen and the Japan Exchange and Teaching (JET) Program interests you, go to the embassy website here for more information. I have become addicted to green tea! However, it’s not because of the caffeine. It’s like having a cup of pure joy. It warms me up during these cold months with a light grassy aroma and fresh flavor. Of course I’m not talking about Lipton’s or any other brand you would buy at the local supermarket either. The tea in those little innocent-looking tea bags is nothing short of undrinkable. That may sound quite snobbish, but it is true. If you buy green tea and the leaves are not green, then it has oxidized. The only tea that should be oxidized is black tea. Oxidation gives tea a slightly bitter or astringent taste, which is fine as long as it is intentional. I have been ordering my tea straight from the source, Japan. I usually find a better bargain with loose leaf teas instead of those in filter bags. The price, while higher than store-bought, is definitely worth it. I have previously ordered higher priced tea, in the $30 per 100 gram range and found almost no noticeable difference in taste to some of the cheaper $12 varieties. My point: go with the cheaper tea. The cheapest tea will still beat out anything you can get in a grocery store or Asian market. 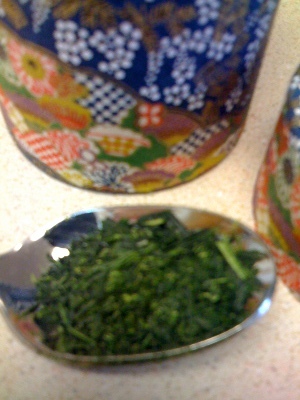 The tea in the picture is an organic kabusecha from O-Cha. Note: cha is Japanese for tea. The site is a little amateurish, but I have never been disappointed by their service or quality of goods. But don’t feel the need to limit yourself to one site, shop around. I mentioned in an earlier post the need for a good dictionary when learning a language. The peculiar thing about Japanese is that there are three different ways of writing the same word. Hiragana and katakana, which provide pronunciation cues, don’t offer much in terms of word meaning. Kanji characters, based on ideographs from Chinese, provide cues to word meanings but can leave a person dumbfounded when trying to pronounce them. There are well over 2000 different kanji characters used in Japan today; so start learning early! P.G. 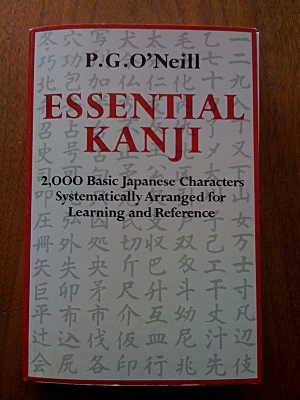 O’Neill’s “Essential Kanji” is another nicely priced book that provides a good starting point for beginners. It shows pronunciation, stroke order, and word meaning for 2000 kanji characters. The book is arranged so that simpler characters are found earlier, while the more complicated characters are later. I wish the book grouped characters together by JLPT (Japanese Language Proficiency Test) levels, but the character ordering is fairly similar. Over the years I have developed quite the fascination for the Japanese. I’ve come to love the food, culture, and the language. Somewhere along the line I decided I was going to try and learn Japanese. Not only did I decide to learn it, but I was going to make the attempt without using a formal learning environment, a.k.a. classroom. This meant I had to find some decent resources. I’ve been a foreign language student in the past; I studied both Spanish and Latin, so I knew I needed to find a good dictionary. 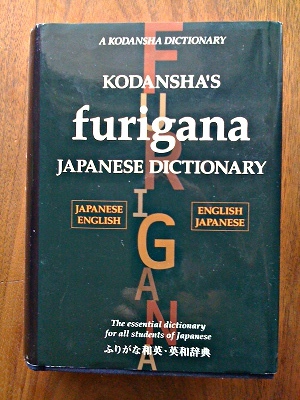 Kodansha’s furigana dictionary was one of the better ones I found for a reasonable price. It is a hardbound book and fairly large. So it’s not going to be something you can carry around on vacation. It gives sample sentences for many of the words, so any nuances in word meaning are quite clear. One drawback for beginning Japanese learners is that you will need to be able read kana (hiragana and katakana). However, a good understanding of these can be learned fairly quickly from any number of online sources. Many websites offer lessons in grammar too, which is necessary to build natural-sounding sentences. I’m still in the process of learning a lot of the grammatical rules and am by no means an expert on the matter. Learning any language takes years of practice, especially when it is fundamentally different than your native tongue. But I hope this will give a push in the right direction.